Firefighters mopped up the remains of a 250-acre wildfire Sunday that busted out two days earlier in a largely residential area near Delta Junction. 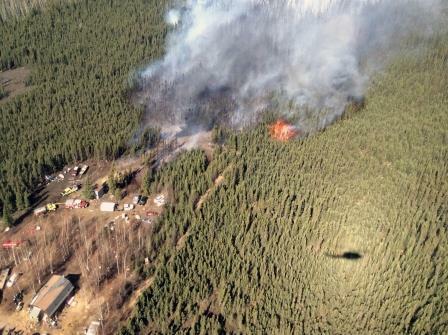 Alaska Division of Forestry firefighters and equipment halted the progress of the North Eielson Fire Saturday. Forestry spokesman Tim Mowry says the fire spread quickly Friday from a forested area off the Tanana Loop Extension road northeast of Delta across three grassy farm fields before running into a forested area near several homes. “There’s quite a few people who live on that road,” Mowry said, referring to the Tanana Loop Extension. Mowry says investigators are looking into the cause of the fire, which was initially thought to be caused by a tree falling on a powerline. But fire managers said Saturday there are no powerlines in the area where the fire began. The fire moved quickly Friday, pushed by south winds in the area blowing 20 to 30 miles an hour, gusting to 50. “It got into a grassy field and spread pretty quickly with the wind that’s blowing down there,” Mowry said Friday. The North Eielson Fire was the fire significant wildfire of the season, he added. Firefighters with state Forestry, BLM Alaska Fire Service and Rural Deltana Fire Department kept the blaze from damaging any homes. An air tanker from Palmer dropped at least two loads of retardant help keep it from spreading. Residents of the area were on alert in case evacuations were ordered, but that didn’t become necessary. According to a Forestry report posted to AKfireinfo.com, three 20-person initial attack crews and a load of eight smokejumpers worked into the early morning Saturday to contain the fire. A bulldozer was being used Saturday to break up windrows and berms that caught fire while about 80 personnel searched for hot spots and mopped up the perimeter of the fire, which was fully contained Saturday night. Forestry’s Delta Area Fire Management Officer Mike Goyette says most of the estimated 250 acres burned by the fire was farm fields. He says conditions throughout the area are expected to remain extremely dry until greenup.